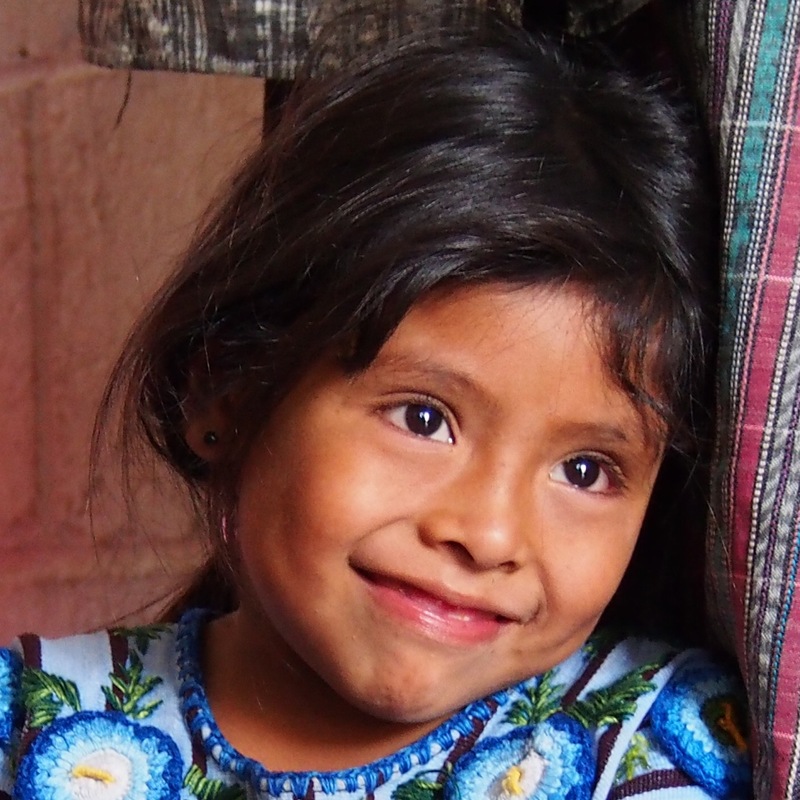 With warm eyes, a smiling face and open arms, five year old Nicolasa welcomed us into the small concrete block home she shared with her mother, Magdalena, in Chuk Muk, Guatemala. As I looked into Nicolasa’s expectant and eager face and then into the weary, prematurely aged face of her Mother, I painfully saw Nicolasa’s future. My heart cracked open. 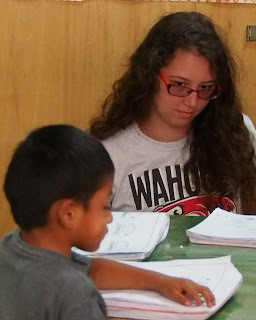 On Sunday, July 21, 2013, a team of 8 adults and 1 youth from Piedmont UU, and 1 adult from the UU Fellowship of Lake Norman (UUFLKN) left Charlotte on an exploratory trip to Guatemala for our Social Justice Council’s World Neighbors project. Those team members were Ann Marie Alderman, Darla Davis, Emma Gardiner-Parks, Holly Summers, Mimi Davis, Pam Whistler, Rev Robin Tanner, Tim Brown, Virginia Gil-Rivas and from UUFLKN, Amy Hartman. We were met in Guatemala by three additional team members, Lea Pellet and Lynn Thompson with the Maasai American Organization and later in the week by Rev. Nancy Allison of Holy Covenant United Church of Christ, Charlotte. Many months of work and planning had preceded this flight. Some of us had attended conversational Spanish classes taught by member Amanda Howard. We’d had conference calls and done preparatory work. Lou Gardiner-Parks had exchanged our dollars for the Guatemalan currency of Quetzales. In many ways we were prepared. But with our feet on the ground in Guatemala we all knew we had much to learn. And that was exactly why we were there! We had been inspired to make this trip by the work of our late member Jodie Kacer. For many years, Jodie had worked with the Maasai American Organization (MAO) in Guatemala and Kenya. She frequently talked with great passion about this work. 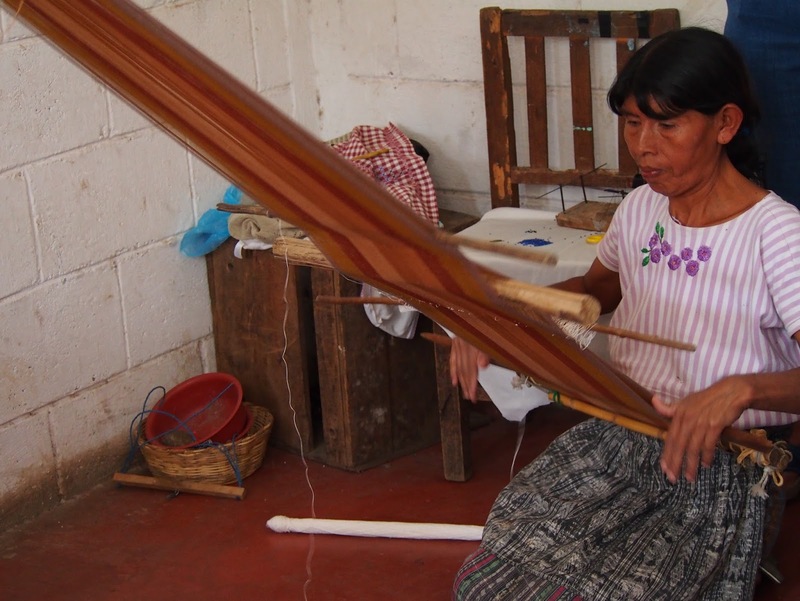 On several occasions, Jodie brought handcrafted goods from Guatemala and Kenya to PUUC to sell in support of women in those countries. 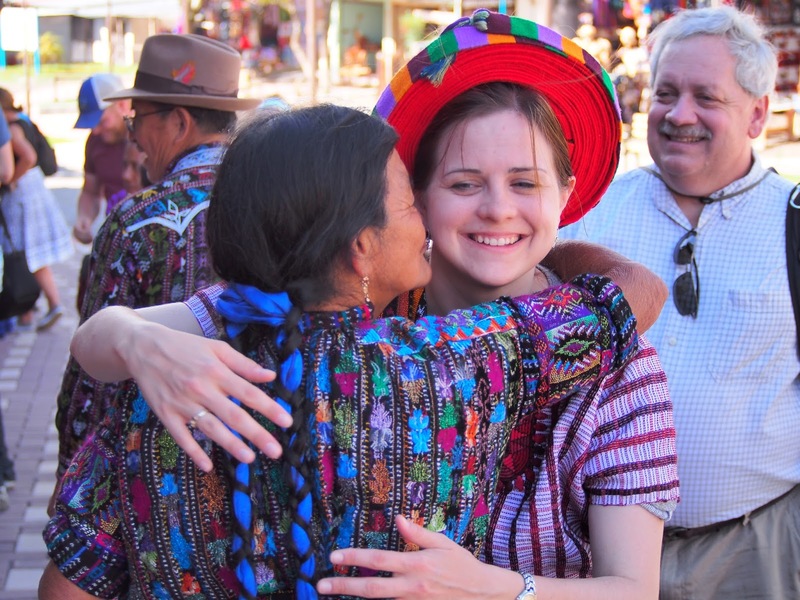 Near the end of Jodie’s life, she expressed her hope that Piedmont UU would find a way to continue to support the women and children of Guatemala. The PUUC Social Justice council had been talking about broadening and balancing our local social justice work with a global component. As we watched films like “Brother Towns”, we were noticing how our laws and the actions of individuals and corporations in the US are connected to and impact people in other countries. We were noticing how what we do here flows out and then comes back to us through the interconnected web of all existence. And so, a growing interest in learning more about those connections developed alongside the dream that Jodie had as she died. With intentionality, we went exploring and learning. We approached this trip as a spiritual pilgrimage. According to author Phil Cousineau in The Art of Pilgrimage: A Seeker’s Guide to Making Travel Sacred, “a pilgrimage is a spiritual exercise … a journey of risk and renewal. For a journey without challenge has no meaning; one without purpose has no soul.” So we set out with open and willing hearts on this journey of risk and renewal. Our PUUC team was deeply grounded in Unitarian Universalism. 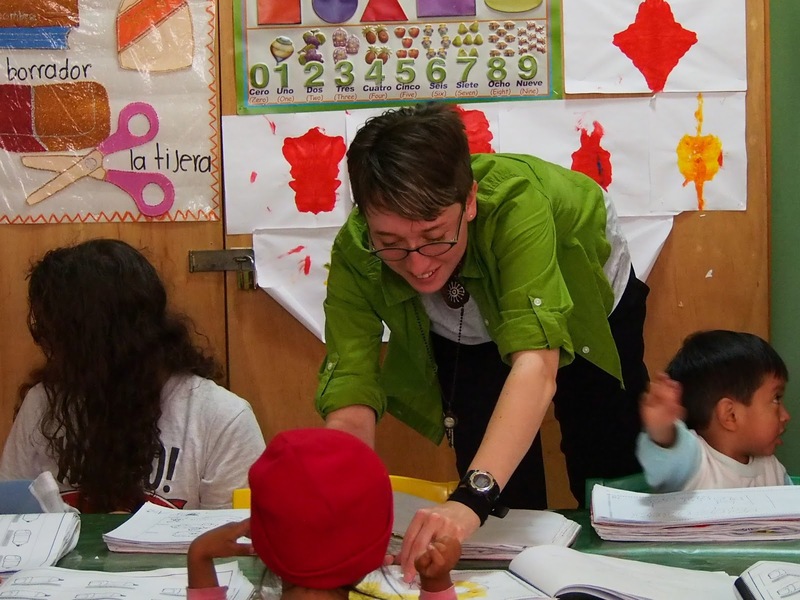 Ann Marie is a UU minister who would began serving the UU Church of Greensboro on August 1st. Darla Davis has been a UU for over 30 years and has served PUUC as President and in many other roles. Emma Gardiner-Parks grew up in our congregation. Holly Summers is a new member and brought that fresh perspective to our group. Mimi Davis is a long time UU and has been a member of several UU Congregations. While at PUUC, Mimi has led the Fellowship Committee, the Peace Alliance and the Garden Group for many years, as well as served on the Religious Services Council and many other committees and roles. Pam Whistler is also a long time UU, is currently a member of our board, a past Fundraising Co-chair and has served on the Southeast District board. Tim Brown has been a member of PUUC for several years co-leading our canvas, participating in Chalice Circles and the Men’s group. Virginia Gil-Rivas has also been a member for several years, leading Interweave and currently co-chairing the Social Justice Council with Darla Davis. As humans, when we see problems and suffering, our brains, of course, immediately want to formulate solutions. It’s uncomfortable to just be with the suffering of others and so we are tempted to ease our discomfort by applying solutions. But we had covenanted with each other to stay open and trust the local wisdom to guide us. 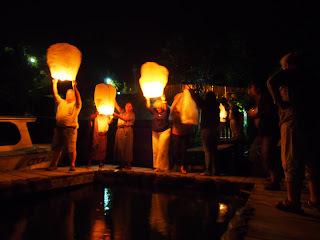 So while ideas were flying, we held them loosely without getting too attached to any one. 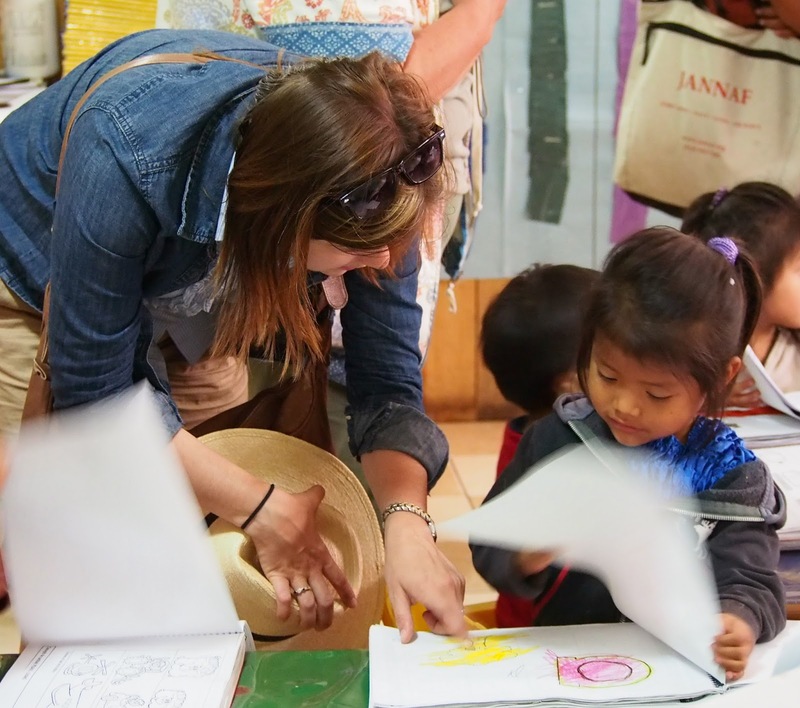 Our explorations led us to a multi-faceted program run by the Mayan Families organization; the Open Door Children’s Library and Education Center; an Elder Care Center run by Sharing the Dream: Hospitalito Atitlan, a private non-profit hospital; and Escuela Privada David LaMotte a private preschool and first grade. 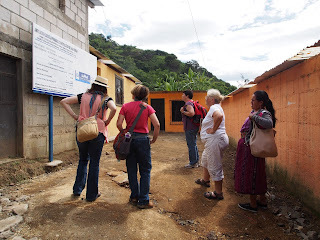 We went to the villages of Chuk Muk, Chacaya, San Jorge and the towns of Santiago and Panajachel. At the end of our time in Guatemala we met to discuss, compare and begin to form a common direction for what might be next and with which partners. Some hearts were drawn to each program. While individual team members may want to support efforts of one of the other organizations, the Mayan Families Organization was the one that everyone agreed offered the most promise for a sustainable program. So as we continue our exploration and research this year, we will be looking most closely at the possibilities with Mayan Families as a potential partner. 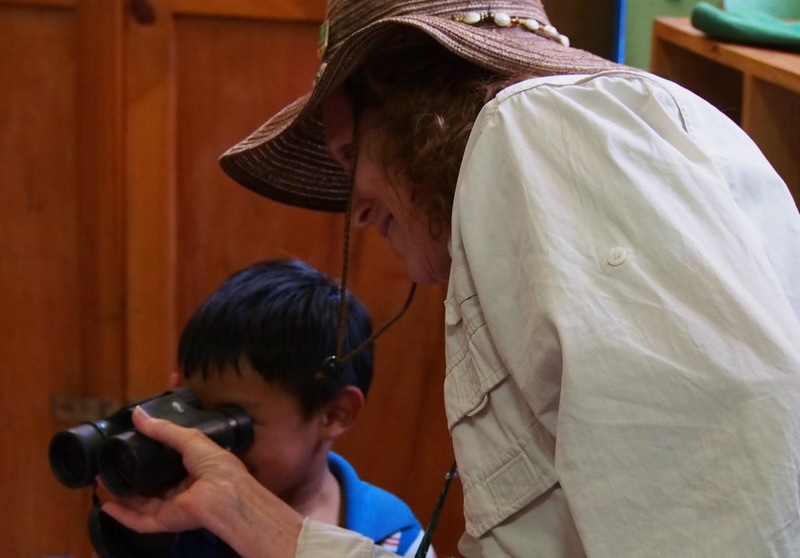 To share more of the impact of our trip, the Guatemala exploration team will offer an evening of photos, stories and food in October. Please watch for the announcement later in September and mark your calendar! You won’t want to miss seeing the beautiful faces of the Guatemala people and the lush, rugged countryside. 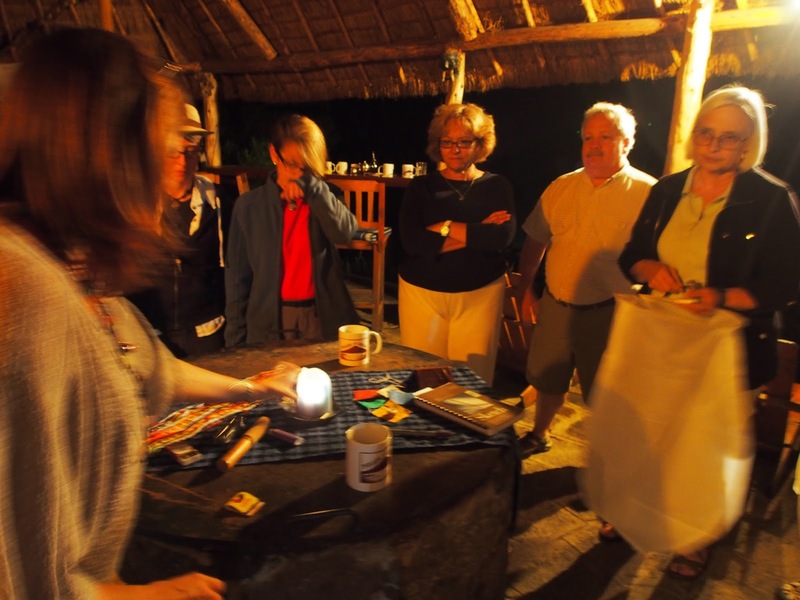 And you certainly won’t want to miss hearing how each team member was touched deeply by this transformative experience. Mimi Davis getting a warm welcome from Nicolasa as we entered the home she shares with her Mother, Magdelena. Rev. Robin and Virginia Gil-Rivas of PUUC, Amy Hartman of the UU fellowship of Lake Norman, Lea Pellet of the Maasai American Organization and our Guatemalan translator Fely Ratzán as we inspect the school building expansion in Chacaya, Guatemala. 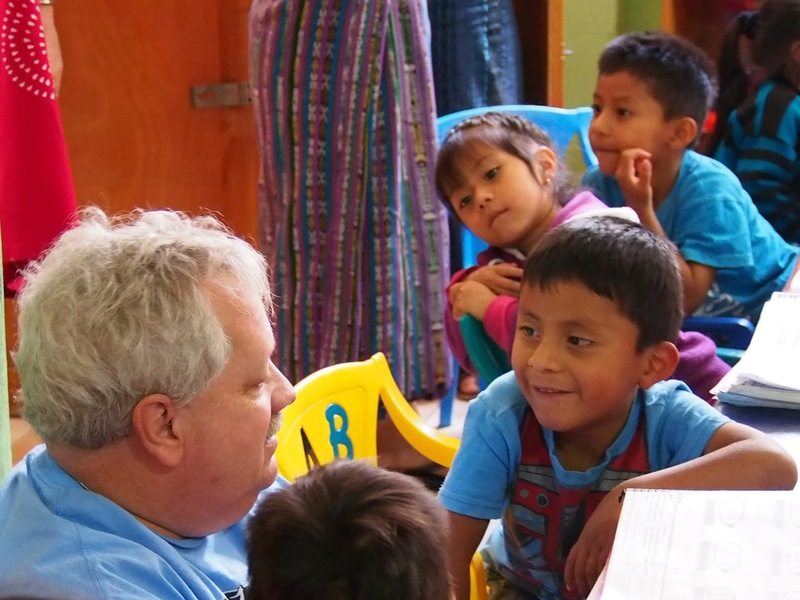 Tim Brown talks to the children at the school in San Jorge, Guatemala, operated by the Mayan Families Organization. Pam Whistler gives a Mayan boy his first look through binoculars at the Mayan Families run school in San Jorge, Guatemala. Emma Gardiner-Parks listens as a young student explains his work at the Mayan Families Organization's school in San Jorge, Guatemala. 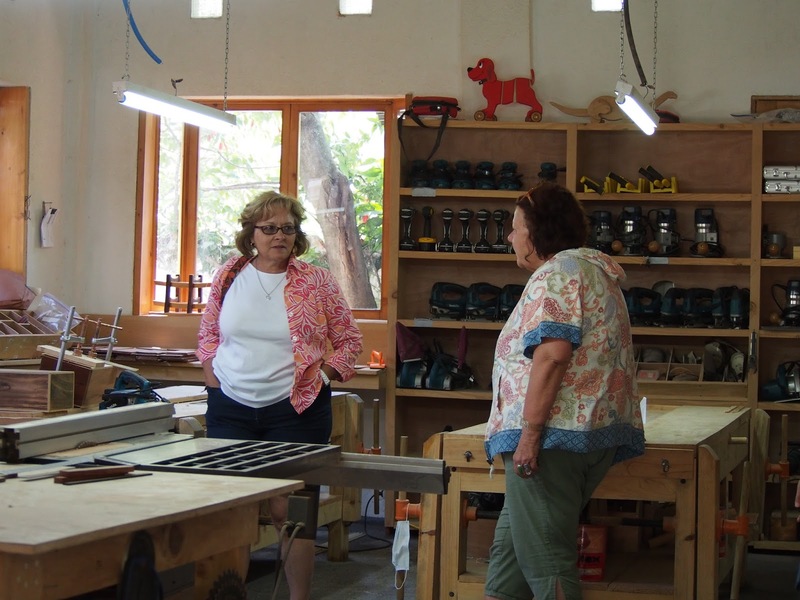 Rev Ann Marie Alderman of PUUC and Lynn Thompson of Maasai American Organization discuss what the are learning about the woodworking classroom provided by the Mayan Families Organization. Holly Summers asks a young student about her work at the San Jorge school operated by Mayan Families Organization. Rev Robin has the attention of a young scholar at the Mayan Families School in San Jorge, Guatemala. 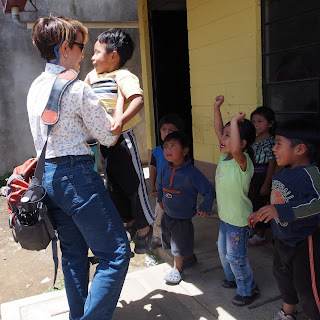 The children at the Chuk Muk school run by the Mayan Families Organization all want to be the next one Virginia Gil-Rivas picks up. A Mayan woman gives Rev. Robin a spontaneous hug and kiss when she sees Robin on the street in traditional Mayan clothing. Tim Brown looks on with a smile. Rev Robin lights the chalice for our closing evening's spiritual reflection, with (l-r) Holly Summers, Virginia Gil-Rivas, Rev. Ann Marie Alderman, Tim Brown and Mimi Davis. Our hopes for the future work of our congregations in Guatemala are launched inside (environmentally safe) lanterns. (l-r) Tim Brown; Fely Ratzán and her Mother; Rev Ann Marie Alderman; Rev Robin; Rev Nancy Allison of Holy Covenant United Church of Christ, Charlotte; Pam Whistler, Amy Hartman of UU Fellowship of Lake Norman; and Lea Pellett of Maasai American Organization.